This is another variety I happened upon a Seedy Saturday in Nelson, BC – but I never had an opportunity to grow it until over four years later. 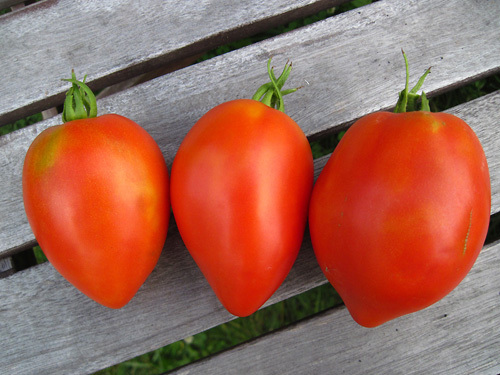 What I have discovered is that this particular variety I grow isn’t like the ‘Perestroika’ detailed by so many others – about the only thing in common it shares is the name. While if you do a search of ‘Perestroika’ online you’ll find images of smooth, round fruit, the one I have (pictured above) is markedly different. This is another one of those times when I wish I had kept the name of the lady who I got these seeds from. The name implies it was a natural cross that occurred but kept the same name, but that’s simply a guess on my part. I may add ‘Plum’ to the name in order to differentiate in the future. This plant has a very distinct weeping growth pattern, with slightly elongated leaves. The leaves don’t provide much cover – the coverage is fair at best, but the plant doesn’t seem to need the coverage to protect the fruit. Even with hot temperatures, both plant and fruits did well with minimal protection, and with irregular watering. Another later variety for a shorter season, coming in at about 80-85 days, it still is very reliable with production, giving me on average, 8lbs per plant. This is another heavily sprawling plant, so it needs a lot of room to move around. I grew it up a spiral metal stake, and the plant did quite well in climbing up and supporting itself, but the offshoot stems required some pretty heavy tying up. This one is pretty impressive to look at – a large, plum-type fruit, about 4.5″ – 5″ long, and about 3″ wide. The fruit averages about 7 oz (200 gr) each, and is nice and firm. The fruit is relatively uniform with just a bit of variance, and showed no green shouldering at all. The fruit also did very well against irregular watering and dry conditions, not having any catfacing or splitting under those conditions. Very nice, smooth texture and flavour. 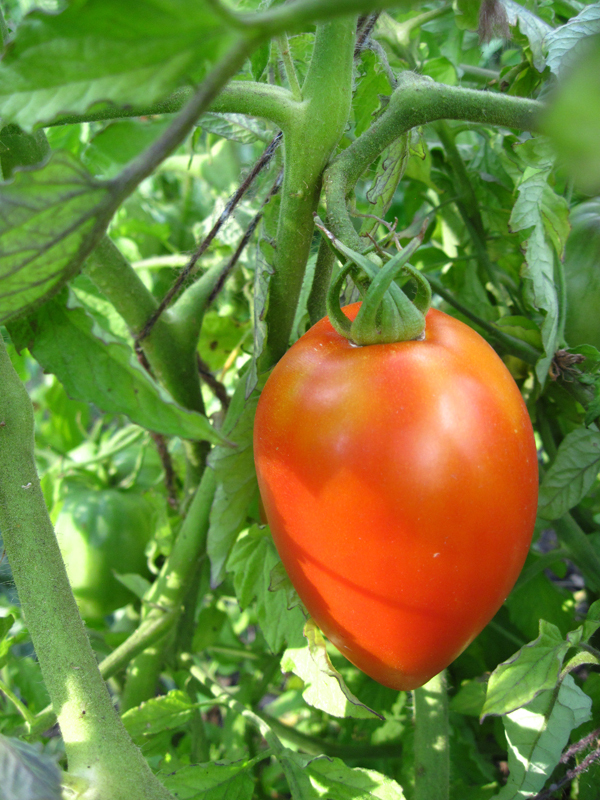 While the tomato can be used for sauces, and I think could even be used for paste, it has enough juice in it not to be overly dry, which gives it a good all-purpose use for the garden. 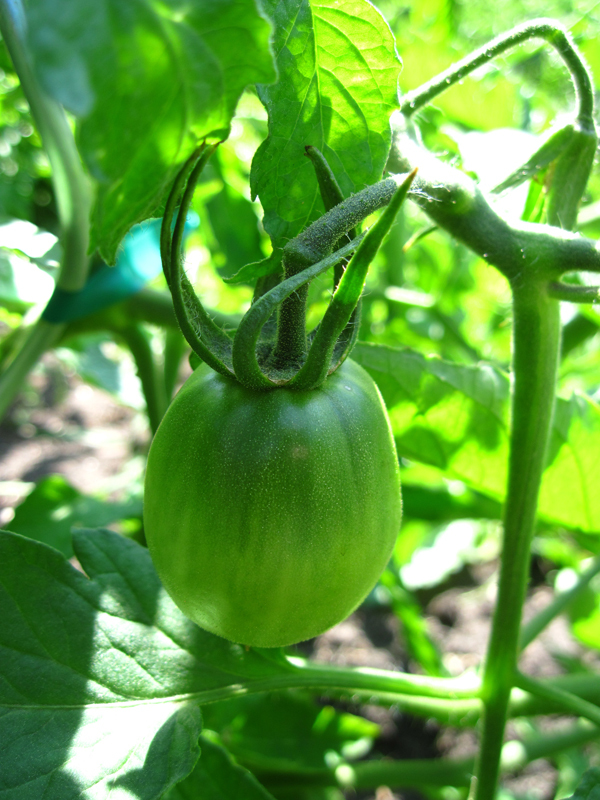 This is a great all purpose tomato for the garden. It wouldn’t produce much in a very short season, but works well in my climate as a later-season variety for preservation, and would work well in a longer, dryer climate for longer-season production. Unfortunately I can’t attest to its growth in a wetter climate, as I never had the chance to grow this one on the coast, but I’d be very interested to hear from anybody who’s received the seed from me on a wet coast if they have any experience.